As a victim of this demonic influence, players will have to choose between the powers offered by this evil or to reject the demonic influence, developing heroic talents instead. Dangers, and enemies becoming more terrifying and fearsome in battle, will be temptations to acquire more power by giving up part of the hero’s soul to the demon. Progression of the demonic influence will be reflected by the transformation of the hero’s body. Through its different chapters, Bound by Flame will offer many quests around a primary, epic adventure. Depending on the choices made by the player and the influence of the demon, some chapters will offer different scenarios and a different experience, adding important replayability to the game. Real-time battles are impressive and dynamic. If the player begins the game knowing only the basics of combat, fire magic, and assassination, he will be able to specialize by unlocking and improving many skills and powers, through 3 different skill trees. Bound by Flame lets the players customize their character. During the creation of their hero, players will be able choose their gender and freely alter their facial characteristics. This will of course have an influence on the demon’s appearance. Bound by Flame also includes a crafting system, allowing them to create and improve equipment, including their armor and weapons. Several companions will join the player during his quest, and will, depending on the player’s actions, develop friendship, romance or rivalry. 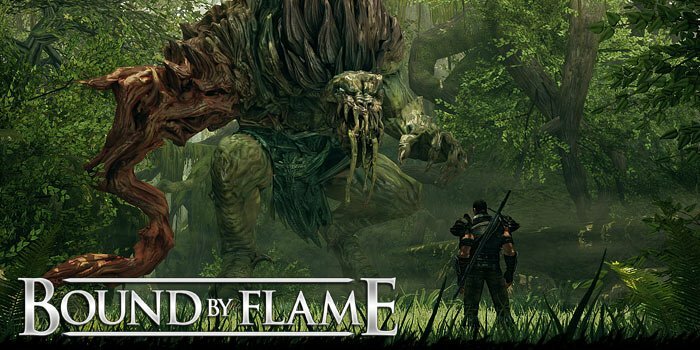 Bound by Flame is targeted for release at the end of 2013 on PC, PlayStation 3 and Xbox 360.